This story is true. Every bit of it. Even though it was documented by camera phone, that doesn't make it any less true. I took Hyrum and Evie to the mall. I never go to the mall. Especially with two little kids. And especially especially without a stroller. I'm a seasoned mom, right? But I only needed to exchange Ben's watch. The store had called. It was in stock. The store is right by the entrance. It would be in and out. Piece of cake. Or piece of candy, as it turned out. We walked into the mall, Evie in my arms and Hyrum holding my hand. I was situating the baby on my hip when Hyrum saw something wonderful. Something flashy. Something intriguing. This, my loyal readers, is an automatic cotton candy machine. For just $2, you can watch this machine spin your own sugary confection. Two bucks? Yeah, right. I said, "Go ahead and push the button. You have to put money in it, and I don't have any today (or any other day, for the rest of time, especially for cotton candy)." The machine came to life. A stick dropped from the pile, and blue sugary sweetness began swirling, then adhering to the paper stick. I was a bit flummoxed, thinking surely it would ask for his cash at some point. It never asked. "Open the door and remove your treat. Thank you." There was never a happier boy in all of America. See? What's a mom to do? 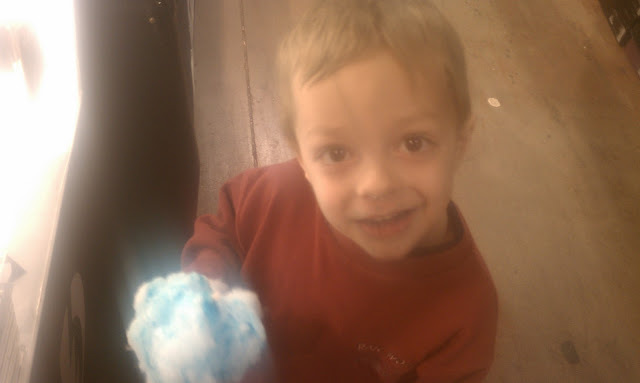 Normally, I would never let him eat an entire cotton candy. But this was manna from heaven, and who was I to deprive? We walked into Zumiez, broken watch in my purse and cotton candy drool all over Hyrum's shirt. It was a quick exchange, and I was trying to explain to Hyrum that this never happens. You always have to put money in the machine to get a treat. 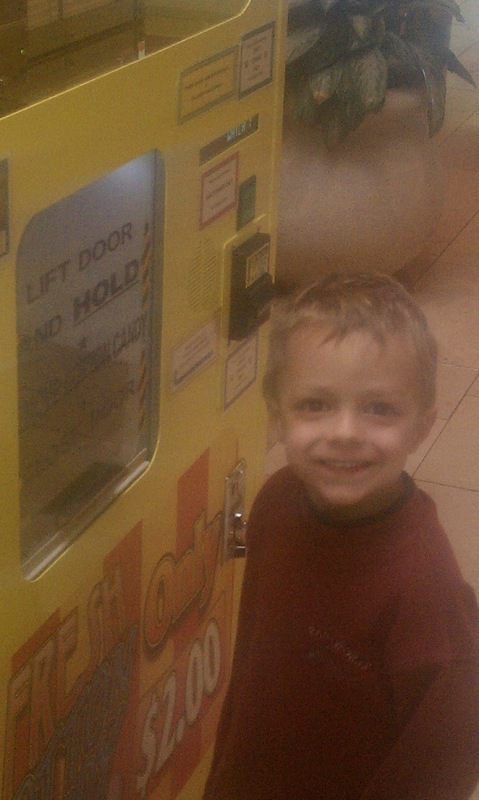 On the way out, I had him push the button again, just to prove my point. Lights flashed again, sugar resumed its swirling speed. And I was made out to be a liar. What was a mom to do? I called the number on the front of the machine to alert the vendor that the machine was broken. Tom answered, listened to my explanation, then replied, "I always set the machine to dispense three free after it's been serviced. Have a nice day." And I let him eat every last bite of that second cotton candy as well. Who was I to look a gift horse in the mouth, and deprive a little boy of one of the best stories of his life? There couldn't be a more deserving, and lucky boy! What a fun candy machine. I love this post! What a lucky little boy! & how nice is that Tom to give out free cotton candy! One of the cutest stories ever! That is so funny that he really does that...and I'm sure it made Hyrum's day! What a lucky little boy. What a wonderful story. The look on that little face says it all - and only in the USA would a serviceman do something so sweet. PS I love the little flip flops! He looks like he's in TOTAL heaven. That is such a cute gooey picture. That is nice of the guy to dispense some free ones too. I suggest however, that you NEVER take Hyrum to that mall again. You probably won't be that lucky again! This reminds me of when I found paper dolls in the rocky wash bed every day for a solid week while walking home from school. I'll never forget the gift from heaven and neither will Hyrum. What a cool story. The drama of your stories always makes me laugh! I would have said...'okay you had enough sugar, toss that one in the nearest garbage.' But you are the better Mom. That is AWESOME! Lucky little Rum Diddy. oh how i love this post! I laughed out loud, and that felt good after a crap day!! he is just adorable! A seasoned mom indeed! Way to go! Wow! What a story. To him it was a miracle indeed! You are a good mama! Two cotton candy's in one day....can't get much luckier than that! I've never seen a cotton candy machine like that before! Fantastic - When does something like that ever happen?!!!! That's a great story. I love when that happens. So funny. And there you are trying to tell him that he won't get it for free, and there it is... AGAIN! Where is this machine exactly and when is it's next servicing? Only kidding, but what a treat. Just look at his sweet, happy face. Did Evie try it? How lucky he was to get that treat. That is the sweetest! 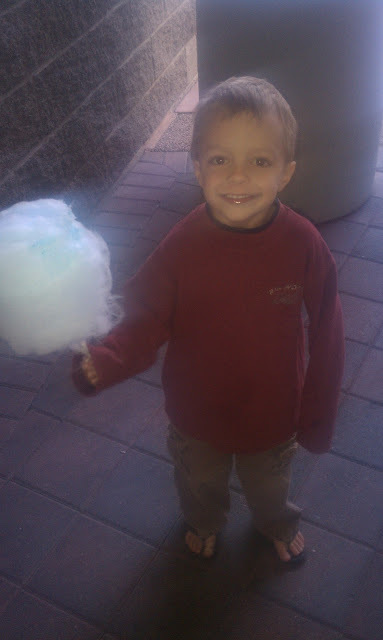 And that face...can't decide which is sweeter Hyrum or the cotton candy! We'll have to be on the lookout for a magical machine of our own!! Yum! So unbelievably cute. Love this! Best Story. Ever. And it couldn't have happened to a cuter or happier little guy. Everyone deserves a miracle once in awhile. That is just too funny! And what a great story too! Wow, talk about it being Hyrum's lucky day. That is the cutest story I have ever heard.